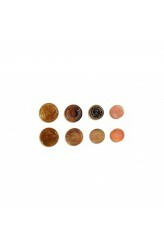 The 50 official metal coins set of CO2: Second Chance. (20x1, 15x2, 10x5, 5x10) ..
Central Italy in the year 753 B.C. : Many new villages have been founded in the region of Latium. This land is prosperous and a strong city here can easily control the trades between the Etruscan cities of the North and the Greek colonies of the South. The region is also rich in salt ponds, and the salt in this period is worth more than gold. There doesn't exist a better place for a new city! The two grandsons of the King of Albalonga – the twins Romolo and Remo, descendants of Enea of Troy – don't want to miss an opportunity to dominate the region and, acting against each other, try to establish two cities close to the Tiber river. Their enterprise is not easy as the King of Antemnae and the King of Crustumerium will also fight to dominate this area! Who will prevail? 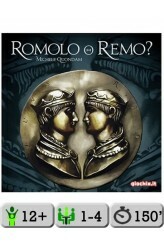 In Romolo ..
First Century B.C., Julius Caesar advances - unrelenting - with his legions. The Romans are now close to the heart of the Celtic lands, where the ancient traditions are still alive and instill courage and determination for the last stand against such a mighty enemy... It is the night of Samhain, the most sacred night of the year. Celtic tribes gather to ask the ancient Gods for help. This time they will ask not only for the strength to sustain themselves, but also for the courage to fight the invaders and - most importantly - for the name of the one that shall lead them to war. 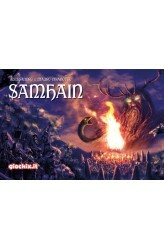 Samhain is a game for 2-4 players that lasts about 60 minutes. In Samhain, you will need to manage your clan the best you can, placing your clan members on the village locations each turn and perfor..
Incited by the economic and political interests of the bourgeoisie, a liberal regime of monarchy was constituted in Belgium on 1830 gaining the independence from the United Kingdom of the Netherlands. The Congress of the new fragile Kingdom called the German Prince Leopold of Saxe Coburg and Saafeld to occupy the Throne: the first Belgian King, Leopold I, took office in the 1831. The new foreign King must solve many problems starting from the industrialization of a rural Country divided by different political and religious groups. 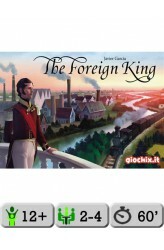 In The Foreign King, players take on the roles of influential Belgian bourgeoisie and who industrialize Belgian provinces, build metallurgical and textile factories in order to obtain greater economic power, vote in the National Congress seeking to inc..